After 5 Seasons of successful airing, HBO's multi-awarded drama The Sopranos is back for its 6th season that starts last May 11, 2009, 11pm in HBO. Sadly this latest season will mark the series' final chapter. Termed as "the most sensational, suspenseful and unpredictably explosive drama series on television” by the Washington Post, THE SOPRANOS has bagged numerous accolades, including 21 Emmys® and five Golden Globes® awards. In this season, new challenges abound for Tony Soprano as his life grows increasingly complicated. Now that he and Carmela are back together, they must face the reality that their kids are no longer children, but not yet grown. And with Johnny Sack in prison, the always-tense relations between the New Jersey and New York families are strained even further. THE SOPRANOS continues to take a darkly humorous look at the members of a New Jersey crime family. Anxiety-ridden Mafia boss Tony Soprano tries to escape the FBI and avoid the inevitable mob power struggles. All these while coping with a shaky marriage to his wife Carmela, and fatherhood to his bad-tempered teenage son and rebellious daughter sends a reluctant Tony to psychiatrist Dr. Jennifer Melfi for help. 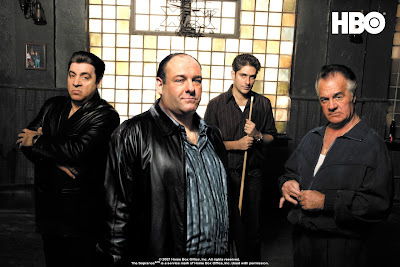 Creator David Chase’s drama series stars three-time Emmy® winners James Gandolfini as Tony Soprano and Edie Falco as Tony’s wife Carmela, plus Lorraine Bracco as therapist Dr. Jennifer Melfi, Emmy® winner Michael Imperioli as Tony’s nephew Christopher Moltisanti and Dominic Chianese as Uncle Junior. Also returning to the series are regulars Jamie-Lynn Sigler as Meadow Soprano, Robert Iler as Anthony Soprano, Jr., Tony Sirico as Paulie Walnuts and Steven Van Zandt as Silvio Dante. Aida Turturro, who plays Tony’s sister, Janice, will return to the show as a series regular, as will Steven R. Schirripa as Bobby “Bacala” Baccalieri, John Ventimiglia as Artie Bucco and Vincent Curatola as Johnny Sack. 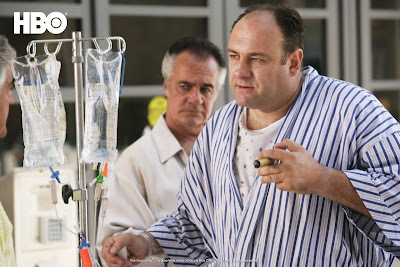 Other cast members of THE SOPRANOS this season are Ray Abruzzo as Carmine, Frank Vincent as Phil Leotardo, Joe Gannascoli as Vito Spatafore, Max Casella as Benny, Lenny Venito as Murmur, Carl Capotoro as Little Paulie, Dan Grimaldi as Patsy, Katherine Narducci as Charmaine Bucco, Sharon Angela as Rosalie Aprile, Maureen Van Zandt as Gabriella Dante and Toni Kalem as Angie Bonpensiero. Guest stars for the sixth season include Jerry Adler (In Her Shoes), Tim Daly (Wings), Frankie Valli (Four Seasons lead singer), Hal Holbrook (Men of Honor), Ben Kingsley (HBO Films’ Mrs. Harris, Oscar® for Ghandi), Julianna Margulies (ER), Treach (HBO’s First Time Felon), Ron Leibman (Garden State), Elizabeth Bracco (Analyze This), Sydney Pollack (Eyes Wide Shut), Daniel Baldwin (Homicide: Life on the Street), Frank John Hughes (Catch Me If You Can), Jonathan LaPaglia (The District), Ken Leung (Inside Man), David Margulies (Law & Order), Lord Jamar (HBO’s Oz), Geraldo Rivera and Nancy Sinatra. Other familiar returning faces include Robert Funaro, Tom Aldredge and George Loros. The sixth and final season of the critically acclaimed drama had akready begin last Monday 11 May 2009, 11pm on HBO. Two new episodes premiere back-to-back on Mondays at 11pm. For more information on schedules and play times, log on to www.hboasia.com.